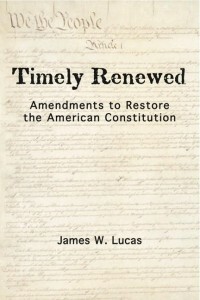 Timely Renewed: Amendments to Restore the American Constitution is available from Amazon and other online retailers. Timely Renewed: Amendments to Restore the American Constitution examines how this came about, not through the careful amendment process provided in the Constitution itself, but rather by the actions of a Supreme Court which has arrogated to itself the power to change the Constitution by a simple five vote majority. Speaking to both “liberal” and “conservative” viewpoints, it asks: Can the American people regain control over their national government? Neither Supreme Courts nor Congresses have rolled back this unconstitutional centralization of power. Timely Renewed proposes another way to restore the power which has been taken from the American people. This is to return to our foundational document, the Constitution. To achieve this, Timely Renewed sets out a series of specific amendments to the Constitution restating the original understandings for our time. These proposed amendments recognize that we are not in the world of 1787. They take account of modern conditions, showing how the original constitutional understandings can not only function in our times, but reverse the centralization of power which is robbing us of our prosperity and freedom. Whether or not one agrees with all of the proposed amendments, or believes that other amendments are also urgent, Timely Renewed provides critical insight into how our Constitution became so misused, and offers a specific strategy for repairing and restoring it. The Constitution declares that it is by “We, the People.” Timely Renewed shows how we, the people, can take back our Constitution. James W. Lucas is an attorney and entrepreneur. Although he lives in New York City and received a law degree from Columbia University, he is not a member of any ruling elites.